It has been found by the National Education Association, that children with more access to different types of reading materials are higher in reading proficiency, and children that read more at home have higher math scores. Reading is such an important skill and habit that can help shape the future of a child. 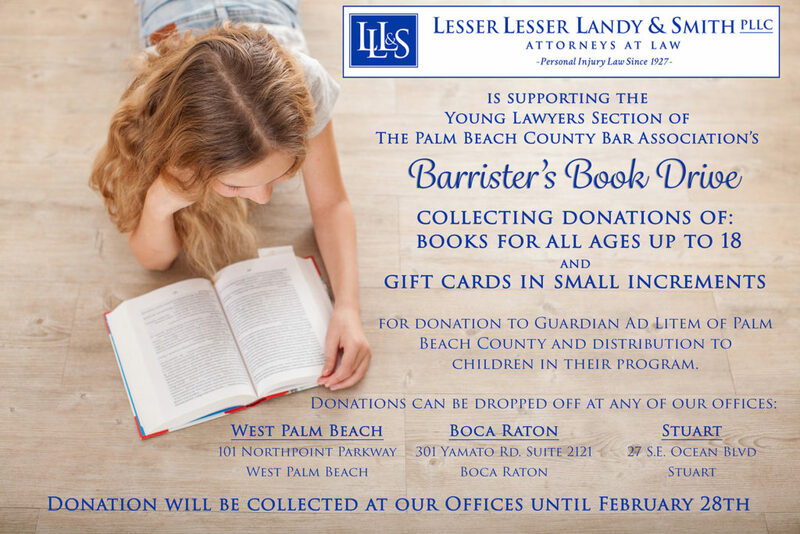 Through donations to the YLS Barrister’s Book Drive, you can help mold the mind of a child in the Guardian ad Litem program and open the door to different worlds, new experiences, and endless knowledge for them. All donations will be donated to the Guardian ad Litem of Palm Beach County for distribution to the kids in their program. According to the U.S. Department of Health and Human Services, there are over 400,000 children in foster care in the United States. For these children in foster care and others that have been abused, abandoned, or neglected, it is programs like the Guardian ad Litem of Palm Beach County that help to be the voice for the children in court and ensure that they are put in the best possible situation. We will be collecting donations on behalf of YLS at our offices in West Palm Beach, Boca Raton, and Stuart until February 28th.